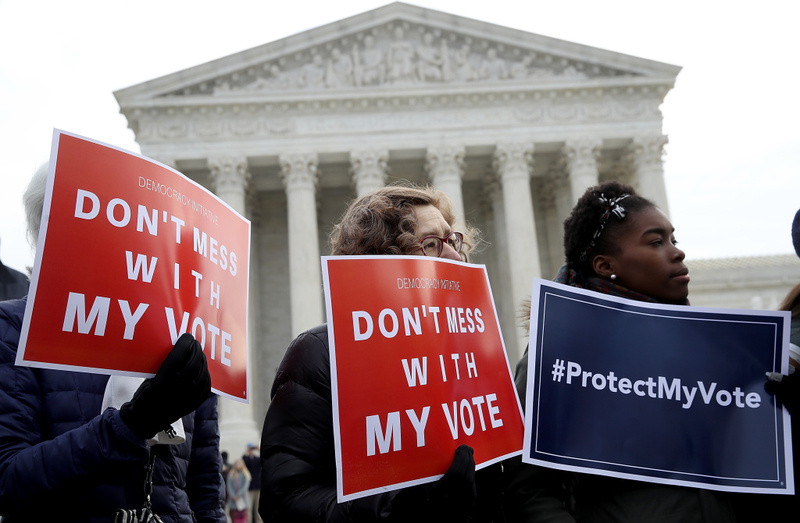 Protesters gather during a rally in front of the U.S. Supreme Court to oppose voter roll purges as the Supreme Court hears oral arguments in the Husted v. A Philip Randolph Institute, a challenge to Ohio's voter roll purges on January 10, 2018. The Supreme Court ruled Monday that states can clean up their voting rolls by targeting people who haven't cast ballots in a while, a case that has drawn attention amid stark partisan divisions and the approach of the 2018 elections. By a 5-4 vote that split the conservative and liberal justices, the court rejected arguments in a case from Ohio that the practice violates a federal law intended to increase the ranks of registered voters. A handful of other states also use voters' inactivity to trigger a process that could lead to their removal from the voting rolls.